Unusually calm and intelligent Ferengi. Science officer aboard Bok's marauder. Questioned his commander's actions in the Jason Vigo incident. 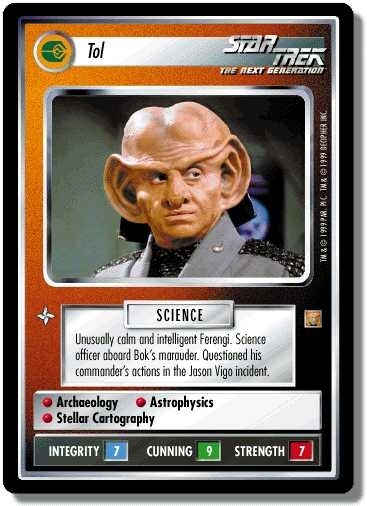 Characteristics: "Continuing Mission"-related cards, affiliation, Ferengi species. There are 24 entries for Tol (ST1E 8 U 103) at the Tradeplace (53 haves and 1 wants). Click here to see all trade list entries for this Uncommon card!